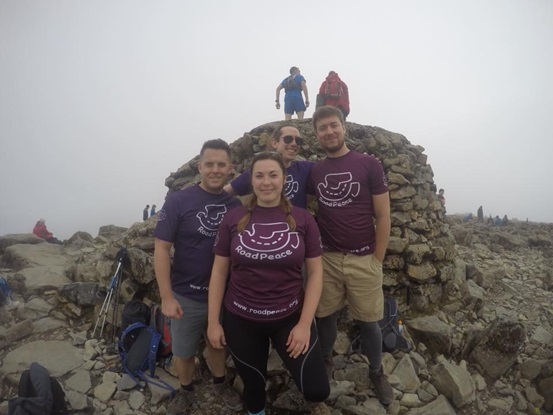 Suggested by Ben Pepper, a solicitor in our complex injury team, the Six Peaks seemed a spectacular challenge to get involved with. 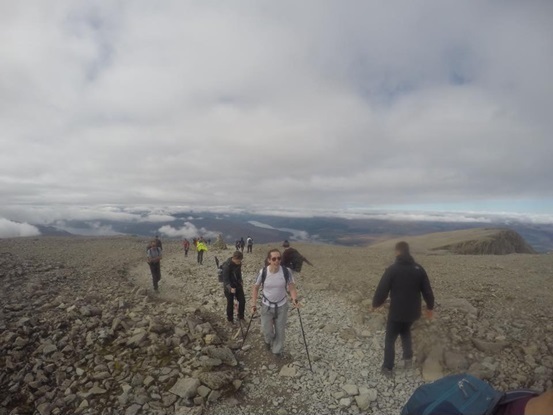 After all, it was DOUBLE the Three Peaks challenge! Who could resist? With a view to support and raise awareness for two incredibly charities – RoadPeace (http://www.roadpeace.org/) and Limbless Association (http://www.limbless-association.org/) – our firm wide team of eight was born. The team then divided into two sub teams – Team RoadPeace consisted of Ben Pepper, Tanith Jones, Jack Ridgway and Joseph Carr, whilst Team Limbless consisted of Bethany Hey, Josh Hughes, Ahmed Al-Nahhas and Glen Silvey. 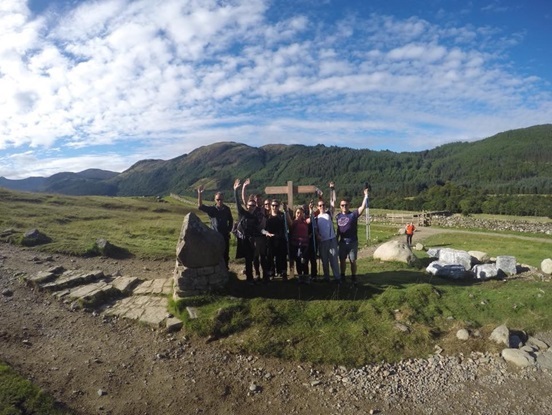 Our first mountain stop was Ben Nevis – the tallest mountain in the UK. We were on the road by 7:00am with our bellies full of scrambled egg, toast and coffee. On the way there, the BBK minibus was bubbling with excitement, fear and laughter. From the windows, we saw the morning light bouncing off Loch Lomond and the stunning Scottish Highlands. After a few jokey “is that Ben Nevis?” remarks about small hills we passed, we pulled into Fort William to see that the base of Ben Nevis swamped them all, and the peak could not be seen from the ground. Freshly stocked with supplies from the local supermarket and delicious chocolate flapjacks baked by our very own Caroline Klage, we were ready to start the ascent with our Mountain Goat (more commonly known as a guide), Brian. The sun leapt out from behind the clouds like Mother Nature’s starting pistol and the challenge began. For those of us who had climbed Ben Nevis before, the ascent seemed to be harder than we’d remembered. Memories of the steep rocky paths started to come flooding back to us, whilst the rest of the team discovered them for the first time. The sun was still shining until we climbed above the clouds around the halfway point. We had our first and only proper break here, next to the waterfall. Spirits were high at this point and everyone was satisfyingly energised by Caroline’s flapjacks. As we climbed higher, the terrain started looking eerily like the face of the moon, with light grey rocks scattered across the ground. After around 3 hours of climbing, we could actually SEE the top! The pace increased. Everyone was desperate to get up and down as quickly as possible because the itinerary for the weekend was so tight. Any time we could make up here would help us. We made it! There was only time for a few photos and a snack before we turned back around and descended to the minibus. Most of the team found the descent much harder, as there was no respite for the knees down the mountain paths. Nevertheless, we were back at the minibus an hour ahead of schedule and feeling invincible. As we hurriedly changed our clothes and retrieved snacks from the boot before departing – the itinerary allowed for a 15-minute turnaround after each mountain, which was surprisingly hard – it began to rain. We’d made it down just in time. When we arrived and got out of the minibus, the rain had not eased up and we were hit with gale force winds, which battered the team for the next 4½ hours. The rain was so torrential that our waterproof jackets and trousers swiftly admitted defeat, leaving us waterlogged and cold to the bone. Whilst I have been unable to come up with a ‘positive’ for the rain, the strong winds made Beth’s walking poles whistle, which provided very, very mild entertainment. Because of the conditions, Scafell was absolutely treacherous. Joe’s glasses steamed up, rendering him virtually blind whilst attempting to navigate the path, which had become a de facto river. Glen slipped on the wet rocks, twisting his knee. Later, we discovered that he had torn some ligaments. My head torch was providing little to no light meaning that I couldn’t see the path in front of me. Despite it all, the team was cohesive and supportive. We stopped regularly to check that everyone was together, we fed each other when energy was low, we sang, we huddled, we told each other we could do it. 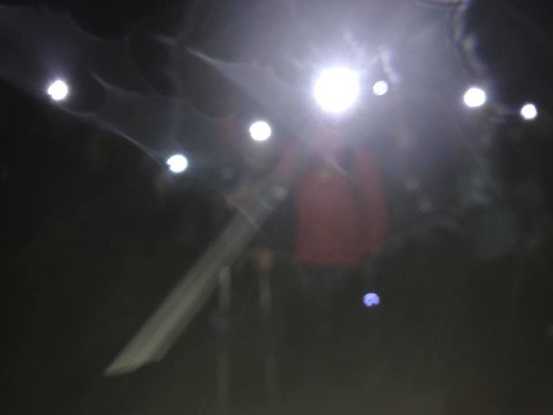 The memory that sticks out most for me is Ahmed becoming my ‘mountain buddy’, walking by my side with a torch so I could see where I was going. Everyone was there for each other, which got us through the living hell we were enduring. The peak of Scafell Pike at around 1:00am! By around 3:30am we were back at the minibus, desperate for warmth and dryness. Our ‘changing room’ was the space outside the minibus. With rain still pouring down we shivered into our clothes for the next mountain. The drive to the start of the Yorkshire Three Peaks took about 2½ hours, meaning that we arrived at around 6:00am. We were greeted by yet more rain and wind. At this point I was advised by our guide to sit out, as he had concerns that I might be developing hypothermia. As I warmed up in the minibus, the rest of the team marched on in relentless conditions. A few hours in, it became evident how badly injured Glen was and he solemnly admitted defeat. 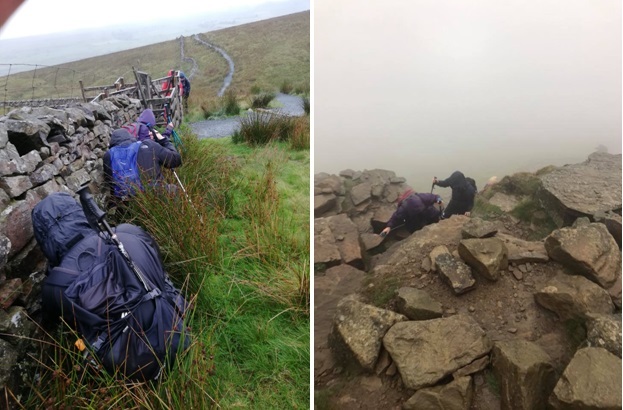 After tackling Pen-Y-Ghent and Whernside, the guide decided that Ingleborough would have to be called off due to dangerous weather conditions. When the team arrived back at the minibus everyone was visually exhausted and freezing cold, partially relieved to be back in the warm van, partially disappointed about the decision. With the heaters on full blast, we left our disappointment behind us and focused on our next and final challenge, Snowdon. By this stage, the elements had really affected the group. Beth was unable to warm up and was shaking with cold. Everyone looked noticeably more pale and unhealthy. At this point morale was quite low. Martyn injected us with positivity by telling us how proud he was and how amazingly well we were doing. Mental determination was essential to get us to the finish line. 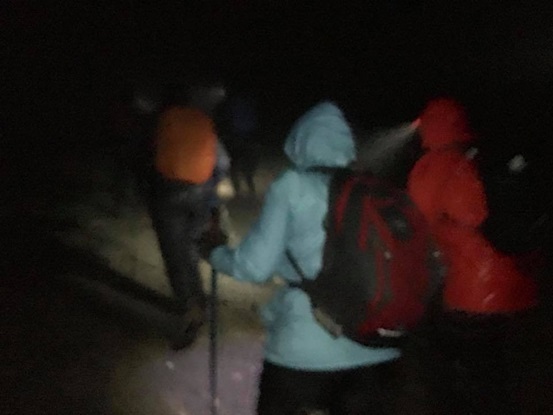 When we arrived at Snowdon at around 8pm, it was clear that Beth was not well enough to carry on and it was suspected that she was developing hypothermia as well. With Beth and Glen hotel-ward bound, the remaining six of us met with our Snowdon guides and set off for the last time. We were lucky enough to catch the pink remnants of daylight as we embarked on the Pyg track. Fortunately, the rain wasn’t falling on Snowdon. If it had been, it would probably have been the straw that broke the camel’s back. The BBK team started off strong and optimistic. Around the halfway point, fatigue and muscle ache had really begun to set in. The Pyg track certainly wasn’t a leisurely walk – at points it involved pulling ourselves up and clambering over rocks. The track was very daunting, given the darkness and the increasing weakness in our legs. Nevertheless, we powered as fast as we could to the top, as we were still going against the clock. 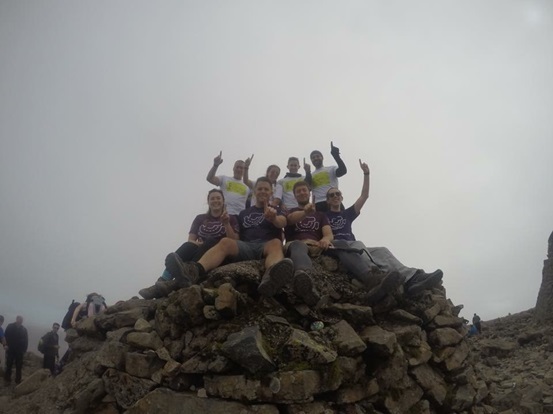 After around 2½ hours of climbing we had reached the finish line atop Snowdon. The emotions we felt at the top were a bit of a mixed bag – I was mainly concerned about being blown off sideways – but there was a mutual feeling of relief and gratification, diluted only by a desire to get back to the minibus and into bed ASAP. We all hugged and congratulated each other and attempted to get a ‘nice’ picture before heading down. The FINAL peak! Here we are at the top of Snowdon… Visibly exhausted to our very cores… with the exception of Ahmed who looked like he’d just been on a refreshing spa day! The walk down seemed to last for about 10 years. At one point, Ben hallucinated shops in the distance, which gave us a huge injection of hope followed by crippling disappointment. For the last hour we were verging on sleepwalking. 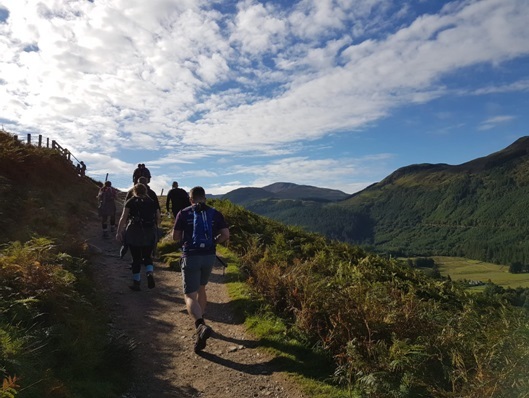 The pace only quickened – for some of us into a light jog – when we turned a corner and saw the warming backlights of the minibus beaming from the end of the car park. Thanks to everyone’s generosity – those who sponsored us, attended our events, shared our pages and bought our cakes – we managed to raise over £10,000 for RoadPeace and Limbless Association, for which we are immensely proud. On a more personal note, we learnt a huge amount about resilience, determination and teamwork and will remember the challenge forever. Tanith Jones is a paralegal in the Adult Brain Injury team at Bolt Burdon Kemp. If you or a loved one has suffered an injury or you are concerned about treatment received, contact Tanith free of charge and in confidence on 020 7288 4864 or at TanithJones@boltburdonkemp.co.uk. Alternatively, complete this form and one of the solicitors in the Adult Brain Injury team will contact you. Find out more about the Adult Brain Injury team.